You may recall me mentioning the deficiencies in my loft and the painful long wait to have them fixed. 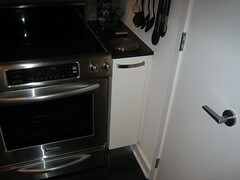 This Monday, after several months, one of the major items was finally resolved: the missing kitchen cabinet door. Oh how it mocked me, but no more!